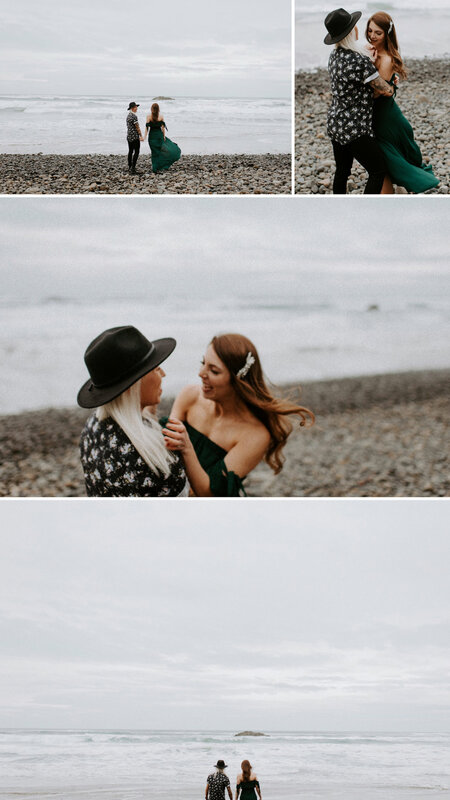 Heather and Kelsey's Oregon Coast Engagement Session | Oregon Wedding Photographe — Madeline Rose Photography Co. When you first meet Heather and Kelsey, you can immediately tell that they’ve been through a lot together. Not because they tell you about it, but because of the way they look at each other and support each other with every little movement. As I learned while we talked throughout our session, they do have a crazy story that involves ups and downs and a viral Harry Potter proposal that even JK Rowling tweeted about. Seriously, grab some tissues and check out the video here y’all. We bonded over our love of Young Adult fiction, vegan food, and Ariana Grande. By the end of the afternoon I felt like I had known Kelsey and Heather my whole life, and am so grateful to have two new friends in Portland. We started out at Hug Point, one of my favorite coastal state parks just 10 minutes south of Cannon Beach. It was high tide, so we had a blast running around on the rocks and avoiding the incoming waves before finally giving in and just jumping in the water. From there we headed to Cape Oswald State Park, one of Kelsey and Heather’s favorite spots that I hadn’t been to before. It has a short hike down to the beach through the woods, so you get a little bit of everything— sandy beach, rocky beach, woods, fallen trees, all of that Pacific Northwest goodness. One Hope Wines sent Heather and Kelsey a bottle of their rainbow glitter champagne to celebrate their engagement, and we had a blast that bottle and dancing to 7 Rings on the empty beach. The Knot has chosen Kelsey and Heather as one of their most influential couples of 2019, so they’ll be up to a TON of fun things before tying the knot this summer. Definitely follow Heather and Kelsey on Instagram so you can keep up with all of their adventures! They have the kindest souls, and I am so lucky to have gotten the chance to document this special season for them.